We’ve been doing a lot to improve the handling of contact data lately. Here’s some new information about the stuff we haven’t yet told you about, and a re-cap of what we have. 1. All contact information should now be added as ‘contacts’ under the relevant organisation’s profile. To be clear: from now on, please do not write contact information into pages as text. You should always create the contact under the organisation, and then insert it into the page using the markdown command. 3. 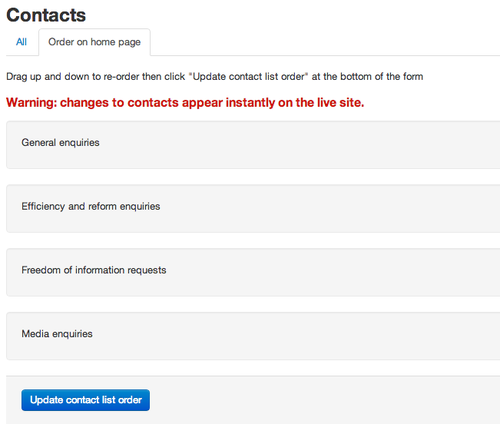 Editors can now have complete control over which contacts will and will not show on their organisation’s homepage. 4. We will imminently be killing the "+ others" link on organisation homepages. All the contacts that the editor has selected to show on their organisation’s homepage will now show, so that none of them are hidden. 5. Editors can also now control the order in which contacts are displayed on their organisation homepage. 6. 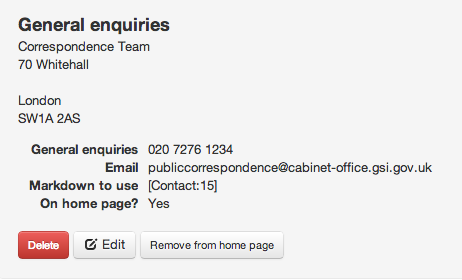 We will imminently be pulling out FOI contact information into its own block on organisation homepages. As per this previous post. 7. There is a corporate information page called “media enquiries" which you can use to list all your press office contacts on a single page. Create the page, add text and insert the contacts using the markdown command. (You may have noticed that this last feature has existed for about a fortnight, but we needed to give editors control over which contacts appear on their org home pages before it was possible for them to put each press desk in as a separate contact, hence only telling you about it now).